Join us Saturday, the 20th of April for a Passover themed seminar! Manna from Heaven Ministries, Remnant of Truth International, Emet en la Torah, and Remnant Remedy Ministries! We will joined by Shekinah Fellowship and Heritage House Ministries (And Prayerfully others groups) for what promises to be one of the most exciting and event filled weekends of the year! Sabbath afternoon event begins at: 2:00pm – 5pm. 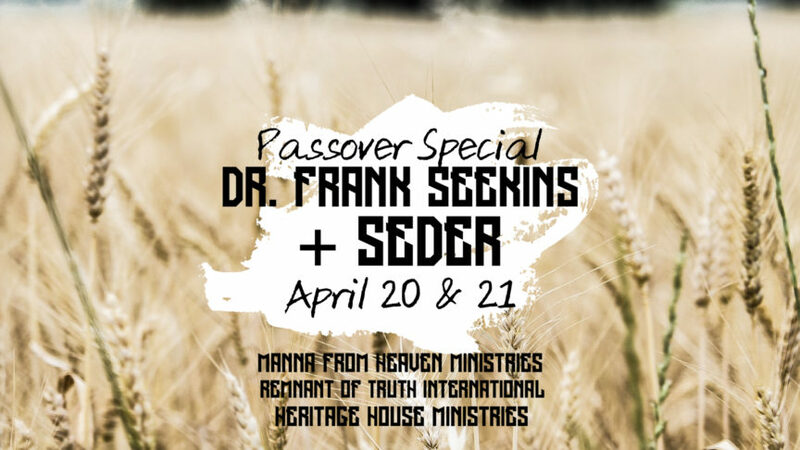 Sunday April 21: We will be joining Heritage House Ministries in Vancouver, Washington for a Passover Seder! You are invited to attend and celebrate with us! If you are attending from out of town and need a hotel room, the Holiday Inn of Salem is offering special rates!